Career Insights: What Does a SharePoint Consultant Do? In our ‘Career Insights’ series, we take an in-depth look into the interesting fields in which a freelancer can work. Today, we’re looking at another highly-niched freelance role: a SharePoint Consultant. Find out what exactly a SharePoint Consultant does, what skills they need, and the potential income someone with these skills can earn. What Does a SharePoint Consultant Do? A SharePoint consultant is the middleman bridging the gap between expert knowledge of the SharePoint platform and managing the expectations of their clients. More specifically, SharePoint consultants help their clients get the most value out of SharePoint by showing them how to use the platform’s capabilities to solve real problems and help their business run efficiently. SharePoint is a web-based platform that can be integrated with Microsoft Office. It is a document management and storage system, but can also perform data integration, server monitoring and a wide range of other highly-configurable features. SharePoint consultants are in high demand, with over 75% of Fortune 500 companies using the Microsoft platform. This is because SharePoint can be incredibly effective at increasing productivity, allowing teams to share information as well as provide added security, storage, and a great platform to build and develop websites. Although it’s an extremely popular platform with businesses, SharePoint requires a lot of customization in order for any organisation to really get the most out of the platform. This is where SharePoint consultants come in. First and foremost, SharePoint consultants will have an exhaustive knowledge of the SharePoint platform, far beyond that of their clients. They need to know more than how to simply set up tools on the platform - consultants need to know a vast amount about the capabilities of SharePoint and what tools can be used for which jobs. There are many tools and add-ons for SharePoint that have been developed by others to solve particular problems. Unless it’s required, there is no need to start all over again, so a good SharePoint consultant should have a wide knowledge of these third-party tools and how they can be used to get to a desired solution faster. While not a must, a consultant who also has knowledge of how to code and program the system is invaluable. Many SharePoint consultants will need to work alongside a SharePoint developer for larger projects but having a knowledge of the development side yourself is extremely helpful. A SharePoint consultant’s first job is to find out as much as possible about the client they are working with and establish how the organisation can use SharePoint the most effectively. Fantastic communication skills in order to use this information and effectively advise on the platform is a must. A SharePoint consultant should always be asking questions. The ability to empathize and understand the needs of the client and end-user are vital, and in order to understand these needs, a consultant must find out everything they can about their client, how their business works, and what problems they need alleviated. For some SharePoint consultants, the job ends with the launch of SharePoint. However, a good consultant will be looking ahead, beyond the launch of the platform and already asking questions about how the experience can be improved. For example, are users being effectively trained on the platform? Is engagement being measured? What is working, and what needs re-addressing? Do SharePoint Consultants Need Any Professional Certifications or Training? However, a skilled SharePoint consultant won’t just stop at the platform itself, especially with Microsoft making changes and introducing new features on a regular basis. Acquiring a good knowledge of SQL, AD, DNS, and keeping on top of the new features and changes Microsoft makes will enable you to establish yourself as a true expert in this field. 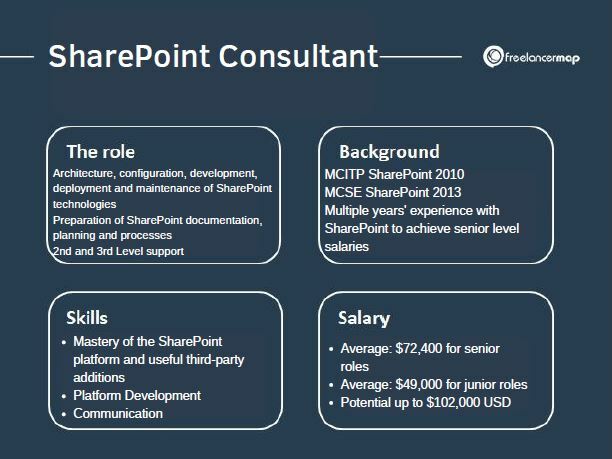 How Much Does A SharePoint Consultant Make? As you can see, being a SharePoint Consultant is a highly technical and niche role, and as such an experienced consultant can be high in demand. According to PayScale, SharePoint administrators can earn up to $102,000 per year, although this could vary depending on the scale of the client you are working with. The salary for junior roles is $49,000 and for senior consultants, the average rate in the US is $72,400. Freelancer rates: How much do SharePoint consultants make? We’ve gone through our freelancer directory to find out what our freelancers are charging on an hourly basis. Our freelance rate index showed that SharePoint freelancers have an average hourly rate of $ 85/hr. (freelancermap freelance rate index October 2018). Considering an 8-hour working day, the daily rate for freelance SharePoint consultants would be around $460 a day.